Case study: Chantier Davie Shipyard invests in AVEVA technology to keep competitive. Prior to engaging with AVEVA ERM, Davie was facing several challenges in regards to the planning and supply chain domain. The challenges revolved around missing visibility of materials for planning, and missing visibility of planning for supply chain. Most of the systems used for managing supply chain and planning were homegrown and supplemented with various excel sheets and access databases. Davie started their transition by purchasing SAP for financials and shortly thereafter AVEVA ERM for material management and planning. One of the challenges which have been overcome is missing materials on the shop floor. As a result of using AVEVA ERM’s integrated planning and materials management capabilities, Davie now has complete status/availability of materials prior to releasing jobs for production with their production teams. This has minimized the requirement for suspending jobs due to missing materials, and because of this, the efficiency of production teams has increased. As a side effect, warehousing also has better visibility of priorities when critical items are received into inventory. “The traffic light system of both the material status and in the planning module is helping us effectively manage the entire material stream, right from identifying early requirements to purchasing actual materials, then getting those materials on-site and out to Production teams to do their jobs on-time and following the Project schedule, while minimizing material wastage and over or under-buying,” said Lindsey. Now that Davie has embarked on this journey, they have realized improvements in terms of the visibility of status on jobs and materials. However, Davie recognizes its improvement journey is continuous and attention shall now be placed on other areas of the business. An example is the management of in-house steel and outfit fabrication, a process which so far has been managed and statused in various spreadsheets and databases. Davie handles most of the fabrications in-house, which makes planning and managing this a large task for supply chain, planning and production. The expectation is that by adapting more of the AVEVA ERM functionality, and making internal fabrication status more easily visible downstream, production efficiency will increase significantly. AVEVA ERM and AVEVA Marine are also seen as important from a business management point of view. 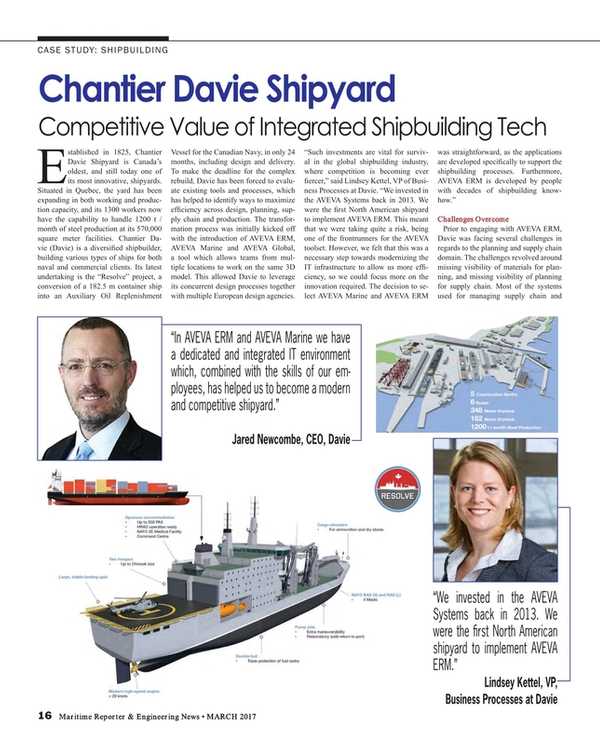 Jared Newcombe, CEO at Davie, agrees that, with these solutions, the shipyard is well placed to face the many challenges which may lie ahead in the shipbuilding industry. “In AVEVA ERM and AVEVA Marine we have a dedicated and integrated IT environment which, combined with the skills of our employees, has helped us to become a modern and competitive shipyard by reducing project cycles and so bringing down our total costs,” Newcombe said.